The celebratory bath with what must have seemed like the finest Champagne had eluded them in Pittsburgh, but it arrived in full force after the Mets defeated the Florida Marlins, 4-0, at Shea Stadium to clinch their first division title since 1988. After Cliff Floyd caught Josh Willingham’s liner to end the game, catcher Paul Lo Duca mobbed Billy Wagner at the mound, and the rest of the team sprinted out of the dugout to join the merriment near second base. - Ben Shpigel, The N.Y. Times. Brazil Beaten at Its Own Game as France Reaches Semifinals - New York Times. "France has also received criticism from the far-right politician Jean-Marie Le Pen, head of the anti-immigrant National Front. Le Pen, as he has done many times, has accused the team of using too many black players. And he has said the squad was not sufficiently respectful in singing the national anthem. The World Cup victory in 1998, achieved with a diverse team with backgrounds in the former French colonies, was considered a victory for multiculturalism and a repudiation of Le Pen's position. That team was widely hailed while winning in its own country. And this one is already being embraced. The victory brought tens of thousands of people and fireworks to the Champs-Elysees. 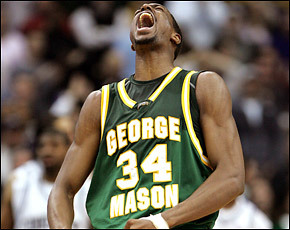 Weekend Guilty Pleasure - George Mason Patriots! Link: Patriots Stun Huskies, Advance to Final Four. 'A sponsorship waiting to happen' - baltimoresun.com. This Olympics, U.S. snowboarders have competed while listening to the personal music device, and skiers, speed skaters and other Olympians from all over the world have been observed listening raptly during practice and before competing. All of which makes for great press. "One of the lasting images of these games is going to be these snowboarders with their iPods," said Abraham Madkour, executive editor of SportsBusiness Journal, a trade magazine that covers the sports industry. "It's the perfect form of subconscious marketing." - Abigail Tucker, The Baltimore Sun; Photograph by A.P. 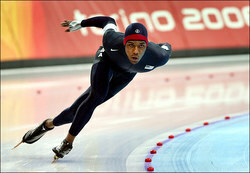 Determined Skater Makes History With Fierce Charge to the Gold - New York Times. Emerging From the Shadows - The Washington Post. Mets and Randolph Launch a New Era. 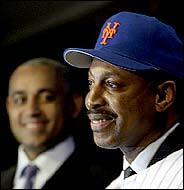 new Mets Manager, Willie Randolph. 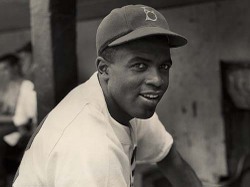 "They stood arm in arm at the front of the room, the Hispanic general manager from Queens and the African-American manager from Brooklyn, looking is if they had just won a game of stickball together." Red Sox win the Pennant! A World Series ticket, Dan Shaugnessy, The Boston Globe. The Yankees learned that good pitching is way more important than The Curse of the Bambino. "He is now nicknamed "the Yellow Bullet." His gold medal is said to be "the heaviest," or most significant, of the 32 that China won in the Athens Olympics. He carried the Chinese flag in the closing ceremonies and has returned home to riches and glory.